The very stones of Jerusalem are political weapons in the age-old struggle for possession of the Holy Land. And nowhere is more sensitive than the great platform built by King Herod, known to Jews as the Temple Mount and to the Muslims as the Haram al-Sharif, the Noble Sanctuary. To understand the current row over excavation and repair work just outside one of the gates onto the compound, it is important to know that here history, religion and politics meet. Nothing in Jerusalem can be understood without all three. It was where Herod the Great ('Great' because of his buildings) constructed, or re-constructed, the Second Temple - and where King Solomon had probably built the First Temple, destroyed by the Babylonians. The Old Testament story of Abraham offering his son Isaac for sacrifice is placed here by tradition. For the Jews, it was once the centre of their world - and the place to which they always promised themselves in exile that they would return. Even today, Jews pray at the nearest point they can reach to the Temple Mount, its Western Wall, once known as the Wailing Wall. Most are content to leave the eventual reconstruction of the temple to the future - and to God. Religious Jews will not even go onto the Temple Mount for fear of stepping on some holy place. Christians know it as the temple where Jesus overturned the tables of the moneychangers. The Romans knew it as a place of Jewish rebellion and, under Titus, demolished it in 70 AD (the Common Era) after the Zealots' revolt, which also saw the siege and fall of Masada. After the Roman empire developed into the Byzantine, it lay largely empty for centuries. Christians were more interested in the site of Jesus' crucifixion. The place was a rubbish dump. 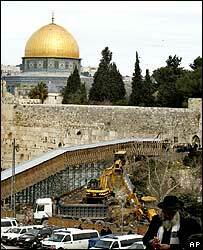 Then in 638, the Muslim army of Omar, Commander of the Faithful, conquered Jerusalem. There was then built one of the most beautiful edifices in the world, the Dome of the Rock, followed by the al-Aqsa mosque nearby. The Dome became, in Muslim eyes, holy because they believe that it was from this rocky outcrop that the Prophet Muhammad in a night journey ascended into heaven on his horse Buraq to receive commandments from God. The al-Aqsa ("The Furthest") was built to commemorate the furthest mosque to which Muhammad states that he travelled from Mecca in his dream. 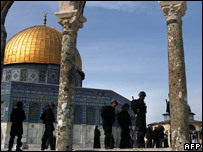 It has become the third most holy place in Islam, after Mecca and Medina. One now has to roll forward until 1967. When the Israelis captured the Old City from the Jordanians, the question as to the future of the compound obviously arose. Political realism prevailed. A compromise was reached. Last year, the earth mound collapsed after a rainfall. So a temporary wooden structure was put up. The current work is designed to replace this with something stronger and more permanent. But it has not only been the Palestinians who have linked archaeology and politics. Over recent years, Israelis have accused the Waqf of deliberately removing evidence of Jewish remains on the Haram/ Temple Mount and dumping them in rubbish fills. Especially after 1967, the Israelis, among them the amateur archaeologist (and illegal hoarder) Moshe Dayan himself, made a concerted effort to dig into history to provide evidence that the Jews had been there and had a right to be there still. "They were digging for God and country," says Father Murphy-O'Connor. "Though it has to be said that those days are over. The younger Israeli archaeologists just dig. They have for example been leading the way in researching the monasteries of the Judean wilderness." But in Jerusalem, you cannot "just dig". There, every stone counts.